After months in the works, new 2strokebuzz t-shirts are finally here! Share your love for the hottest scootering footwear of The Great Scooter Boom of 2008 with a 2strokebuzz “DOT-approved flip-flops” t-shirt featuring artwork by Rod Hunting based on an idea stolen from Silent Ron. 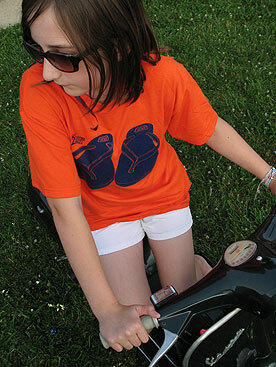 The high-quality Gildan 50/50 shirts are available in safety orange with blue ink or chocolate brown with white ink. Each shirt costs only $17.50 (postage paid!) and comes with a numbered certificate of authenticity. Only a very small edition of 35 shirts are available in each color combo, and will never be reprinted. History indicates that 2SB merchandise sells out quickly, so act now! Order now at our new sister site, Scootmoto. We’ve got big plans for Scootmoto, more on that soon. Note: Just to be absolutely clear, we are not selling DOT-approved flip-flops, as there is obviously no such thing. Neither the DOT nor the Snell Foundation endorse this product. We have nothing but the highest respect for both organizations, and hope this shirt will lightheartedly promote awareness of their work, and promote smart footwear choices in the scootering and motorcycling community. Update: Thanks for all your orders. We’re still sort of getting the hang of our shopping cart, so don’t panic if it overcharged you for Canadian shipping, or you got a notification twice, we’ll get it all straightened out and orders shipped as quickly as possible. Thanks for your patience and understanding, and especially your support. *gasp* $17.50?!?! That’s more than i paid for my “long-ride” flip flops and ‘around-town” flip flops combined!! It’s 2008, brother, $17.50 for a postage-paid t-shirt is a bargain. And clearly, you’re not wearing *designer* flip-flops, like you should be. You mean I shouldn’t wear flip-flops while riding a scooter? What could possibly go wrong? I had a hard time justifying the $179.99 for the Vespa-branded ones that they sell in the same color as my scooter, topbox, and matching helmet. It hurts…it hurts to laugh like this. By the way, I have a blue Vespa helmet for sale…cheap. Way back in high school I used to have a pair of camouflage flipflops. I bought them for the same ironic statement. I miss my camo flipflops. $17.50 is avg going rate, I’ll take one please. *gasp* $20.00 a years member dues; no t-shirt. “Based on an idea stolen from Silent Ron,” I still don’t think it was my idea and it was someone else’s.